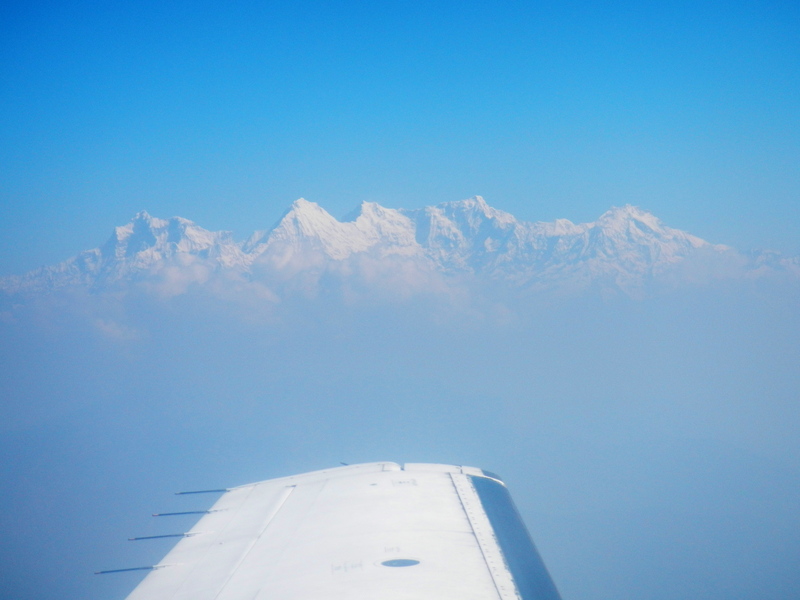 I spend the 45 minute flight from Pokhara gazing at the Annapurna range, which seems to melt into the clouds like a mirage as we wing toward Kathmandu. At the airport, we share a van with two ladies from Asheville, North Carolina (small world) who have just arrived and are joining a group to hike the Ghorepani loop in a few days. I have to stifle a spike of jealousy: they have their whole journey ahead of them, while I have to leave tomorrow. I smile and wish them an enjoyable trek. After lunch, we visit Swayambhunath, also known as the Monkey Temple, located west of Kathmandu city. One of the oldest religous sites in Nepal, the site is considered Buddhist but the place is revered by both Buddhists and Hindus. Climbing the stairs with our guide (the short stairs, not the 365 step route), we gaze at the giant stupa, its painted eyes surveying the city. It’s Saturday, a day off for most folks in Kathmandu. Young couples and groups of friends wander the grounds, munching on cotton candy and sipping from icy coconuts. Families bring picnics and spend the day socializing, praying and reflecting; a group of women are sifting red rice, the remains from an earlier ceremony. It’s a lively place, full of people laughing and children running around willy-nilly. It’s a world away from the solemn churches of my childhood. As I sit and watch two monkeys scamper and swing on a line of prayer flags, I imagine monkeys in the churches I attended as a kid. I’m not sure that the Methodist ladies would have approved, but I would have thoroughly enjoyed it. That evening, we gather for our last supper together in Kathmandu at Phat Khat, a bohemian place tucked in the heart of Thamel. Cozy in the corner table, we toast our journey and play one more hand of dun bohl. We discuss plans for getting together again. I promise to visit Vic and Karen in North Carolina and we’re all dreaming of a trek in the Mustang region. 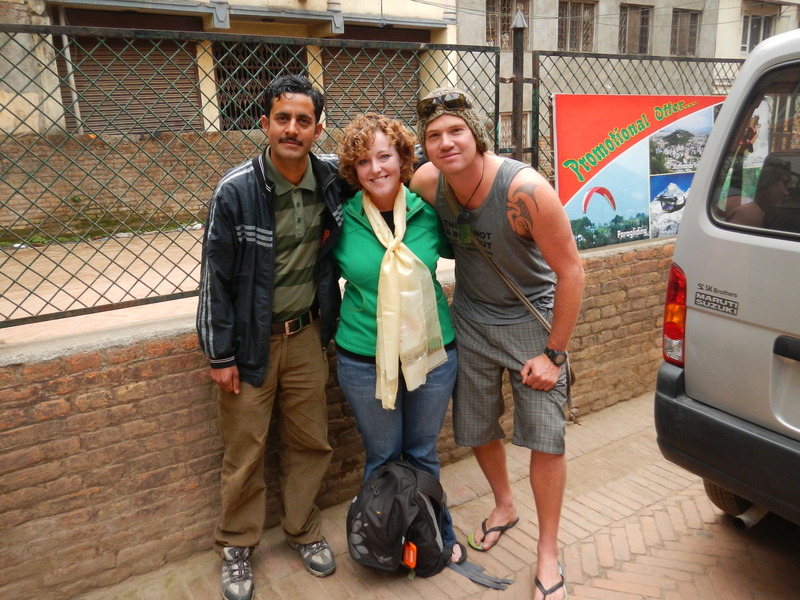 I’m already scheming to get back to Nepal. I decide to exercise caution and make it an early night, though I’d rather stay cocooned in the hazy ambiance and low conversations around me. Navigating our way back to the hotel, I’m desperate to capture every detail: how passing headlights make the stalls of brass statuettes gleam; the repetitive call from pedicab drivers offering me ride; the scent of incense that mixes with various pungent odors rising from the street. It’s chaotic and dirty and overwhelming and wonderful. Gokul, me and Dan. And the van that’ll take me away. Dan and Gokul are there to see us off the next morning. Gokul presents the three of us with prayer shawls for safe travels. I tell him feri perto la: I’ll see you soon. I hope that I do. I snuffle as we pull into Kathmandu traffic; I turn towards the window so that the ladies don’t see me wipe my eyes (they do anyway). On my flight to Singapore, I think about the fact that the amazingness of this trip was due to the sum of its elements: a small group of like-minded people, excellent weather, gorgeous natural scenery and guides that are passionate and knowledgeable about Nepal. I know that when I return, it will be different. It won’t be the same experience twice. However, there are some things that I think will remain. I can’t help but think I was my best self on the trail: the most positive, the most determined, the most awed. I worked hard, it was difficult, but I didn’t give up (even though I considered it on a few stair climbs). I’m grateful that Nepal, and the people that I was lucky enough to meet, gave me the ability to realize what I have the capacity to do and be. I know I’m leaving a part of my heart in Nepal, but I’m taking the peace of spirit and unwavering good humor of the Nepali people with me. Mo Nepali chouri. I am a daughter of Nepal. Tags: Kathmandu, monkey temple, nepal, Swayambhunath. Bookmark the permalink.